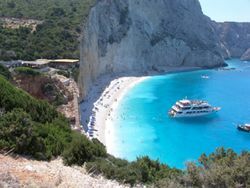 Lefkada is one of the most beautiful places in the Ionian Sea, with beaches such as Porto Katsiki and Eggremnoi. Although Lefkas is an island, it's connected to the mainland by a causeway and floating bridge. The airport, near Preveza, is 20 minutes drive from Lefkas town, at the north tip of the island. Charter flights from many European countries operate to Preveza from May through October. Olympic airways fly to Preveza several times a week throughout the year. Athens is about 5 hours by bus, with several journeys per day. Rental car is the most efficient mode of transportation. "Alexs" on the main Vasiliki road has a modest selection of Mopeds, Quad Bikes and Mountain Bikes for hire at cheap rates. There are also many other car rental places in the resort of Nidri and Lefkas Town. Serious mountain bikers can contact Get Active, based in Nidri to join a guided ride and experience the best trails. Road bikers are also catered for as high quality road bikes with free delivery are available for rent with them also. There are buses that frequently run up and down the east coast of the island between Vasiliki and Lefkada Town, plus buses from the main town to the mountain villages. In high season there are also buses from Nidri to the west coast resort of Agias Nikitas and Kathisma beach. Porto Katsiki beach is firm favourite with tourists. A relatively large and pebbled beach surrounded by white cliffs. All travel guides report this beach as being sandy, but the writer who visited it in June 2016 (after the November 2015 earthquakes) found it to be made exclusively of pebbles the size of one's fist. Bring shoes you can swim in. Whilst it is possible to drive to the beach and take the steps down the cliff, there are also daily boat trips that leave from Nidri and Vasiliki harbour. The journey takes around 1.5 to 2 hours and can be fairly choppy sometimes. Don't forget the sea legs! The wide and sheltered bay of Vasiliki in the South of the island is famous for its Wind Surfing due to the strong and consistent wind (known as "Eric" by enthusiasts) that blows down over the mountains in the afternoons. Cross winds of Beaufort force 9 has been recorded at the beach, but more typical is force 5 - 7 in the late afternoon. The section of beach in front of "Club Vass" is usually packed with Wind Surfers and can be quite a spectacle to watch. It is possible to hire Canoes and Katamarans as well as Wind Surfing equipment on this main stretch of beach. Lefkas is over 70% mountainous and said to be one of the best mountain biking spots in Europe. There are many places to hire push bikes along the high street in Nidri, however these bikes are not very well suited for the terrain and are more suitable for just getting about the town. There is an independent company in Nidri (Get Active) which offers daily guided mountain bike rides for visitors and have specifically designed mountain bikes for the tracks and trails on the island. The harbour at Vasiliki bay houses around 15 Restaurants and fast food outlets, all of which have covered seating outside next to the water. Be aware that on particularly warm evenings the water in some parts of the harbour smells and can be distracting when trying to relax and eat! Food available at the harbour varies from traditional Greek cuisine, to simple meals such as beef burgers and chips and is relatively cheap. It is possible for 2 people to eat a large meal and drink wine for less than 25 Euros. The cosmopolitan harbour front in Nidri is lined with tavernas, restaurants and cafes offering a wide variety of cuisine including Greek, Italian and Chinese. You can choose from delicious three course meals in a taverna to light snacks and sweet treats at one of the relaxed cafes. The main town of Lefkada offers further choice, lined along the seafront overlooking the marina are some very good tavernas offering traditional Greek cuisine. Plus if you venture along the back streets you will stumble across hidden tavernas with diverse menus and some rocking little bars! The most popular beers at the bars in Nidri and Vasiliki are Mythos and Amstel. There is a winery on the island (approx 8km from Vasiliki town) which produces "Lefkadian Land White", a white wine which can be bought cheaply in the supermarkets and restaurants. The village of Agios Nikitas on the west coast of the island is a small fishing village set right on the mountain over the sea. It is a 20 min drive from Lefkada town and a 45 min drive from Preveza airport. You can drive from there to Kathisma beach in 5 minutes. It is full of hotels and restaurants, and has it own beach. Hotel Ostria, one of the hotels, only has rooms that face the sea, and all have balconies. In the summer months, there is a boat-taxi service that goes from Agios Nikitas beach to Milos beach nearby. Otherwise, it takes a 30-min hike to access Milos beach. Crime on the island is low. In Vasiliki it is not uncommon to see doors and windows left open overnight, or restaurant drinks fridges and ice cream freezers left outside overnight without a lock. This page was last edited on 27 June 2017, at 09:44.